So, just for fun, I decided to go through the All-New, All-Different Marvel lineup and make a list of all the LGBT characters so far. And here they are. Billy Kaplan is one of the reincarnated sons of Vision and the Scarlet Witch (long story), from which he derives his large number of mystical powers. He also has a destiny as the next “Demiurge” of the universe. Currently in a relationship with Hulkling. Where can you read about him: Young Avengers vol. 1 and 2. Where can he be seen next: New Avengers vol. 4, as part of the Avengers Idea Mechanics. Teddy Altman is the son of Kree superhero Mar-Vell and Skrull Princess Anelle. As such, he has shapeshifting powers and super strength. Along with his boyfriend Billy, he became a superhero and a member of the Young Avengers. America Chavez came from the Utopian Parallels, a dimension outside of space and time. She traveled around various other dimensions, before landing in the 616 one and meeting up with Kid Loki and the rest of the Young Avengers. She is very firmly a lesbian and has flirted heavily with Kate “Hawkeye” Bishop. Where can you read about her: Young Avengers vol. 2, Siege (Secret Wars tie-in). One of the first gay superheroes, Jean-Paul Beaubier started off as a mutant superhero in the Canadian team Alpha Flight along with his sister Aurora. He could fly, generate light, and had super strength. He eventually became a member of the X-Men and married his boyfriend. After the dead members of Alpha Flight were resurrected, he rejoined their ranks. Where can you read about him: He has appeared in lots of places, most especially X-Men #120 (his first appearance), Alpha Flight #10 (his origin), Alpha Flight #106 (where he is revealed as gay), and Astonishing X-Men #51 (where he marries his boyfriend). Where can she be seen next: Alpha Flight will be a part of Captain Marvel’s team in Captain Marvel, so he will probably be seen there. Aikku Jokinen was a Norwegian girl who was in the proximity of one of Ex Nihilo’s “Origin Bombs” and became bonded to a strange armor. The armor allows her flight, super strength, energy blasts, and more. She has mentioned that she has a girlfriend. Where can she be seen next: New Avengers vol. 4, as part of the Avengers Idea Mechanics. Bobby Drake is a mutant and one of the original X-Men. However, due to the actions of an older Hank McCoy, he was brought forward in time to the present along with the rest of the original team. Eventually, he was revealed as gay by the mind-reading of Jean Gray, although he has yet to tell any of his other friends. It is not yet known if this means the future-version of him is gay as well. Where can you read about him: All-New X-Men. 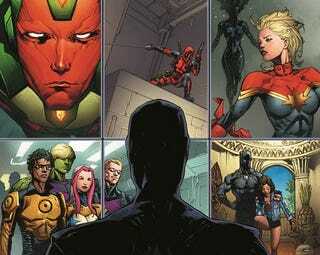 Where can he be seen next: All-New X-Men vol. 2. Angela started life as Aldrif, daughter of Odin and Freyja, but she was kidnapped and presumed killed by the Angels of Heven. In actually, she was adopted and raised to be an Angelic bounty hunter. She became good friends with Sera, a female Angel who used to be male and whom she had rescued from an Anchorite temple. Eventually, she learned of her Asgardian heritage and set out to pay what she owed. After learning that Sera was actually trapped in Hel, she set out to go to Hel and save her. Where can you read about her: Angela: Asgard’s Assassin, 1602: Witch Hunter Angela (Secret Wars tie-in). Where can she be seen next: Angela: Queen of Hel. Angela’s best friend and beloved, Sera started life as one of the rare male Angels and was sequestered in an Anchorite temple. She never felt herself as a male, however, and after she was rescued by Angela, she became female and they engaged in a relationship. Sera eventually died on the battlefield, however, and was confined to Hel, but Angela has vowed to saved her from there as well. Loki Laufeyson is the adopted child of Odin. After many years being a supervillain, he died and was reborn as Kid Loki. Through many different adventures and deaths (seriously, just read Journey Into Mystery and Loki: Agent of Asgard), they ended up as the God/Goddess of Stories. Their current form is genderfluid and they will change between male and female on a whim. Where can they be seen next: The Mighty Thor vol. 2. Betsy Braddock, the younger sister of Captain Britain, was a British telepathic mutant before she had her mind transferred into a completely different, Asian body. She eventually joined the X-Men, wielded a psychic blade, and joined the Uncanny X-Force, where she found she enjoyed killing a bit too much. She also became attracted to the female clone of Fantomex and found herself enjoying a bisexual relationship. Where you can read about her: Many X-Men comics, but most recently Uncanny X-Force vol. 1 and 2. Where can she be seen next: Uncanny X-Men vol. 4. Deadpool. Wade Wilson. The Merc with a Mouth. He has displayed attraction to all genders. There’s really not much else to say. Has a movie coming out next year. Where you can read about him: The many, many volumes of Deadpool and Deadpool & Cable. Hercules (hinted at being bisexual, even though Axel Alonso has said that he isn’t), Mystique (hinted at being bisexual, but never shown), all Asgardians (apparently do not share the same concepts about sexuality as humans do). Karolina Dean, Julie Power, Prodigy, Karma, Anole, Rictor, Shatterstar, Benjamin Deeds, Cullen Bloodstone, Annabelle Riggs, Ren Kimura, Bling, Daken, Raz Malhotra, Tong, Moondragon, Jennifer Kale, Cluster, Yukio, Living Lightning, Striker, and Flatman. Please chime in if you found someone that I missed.